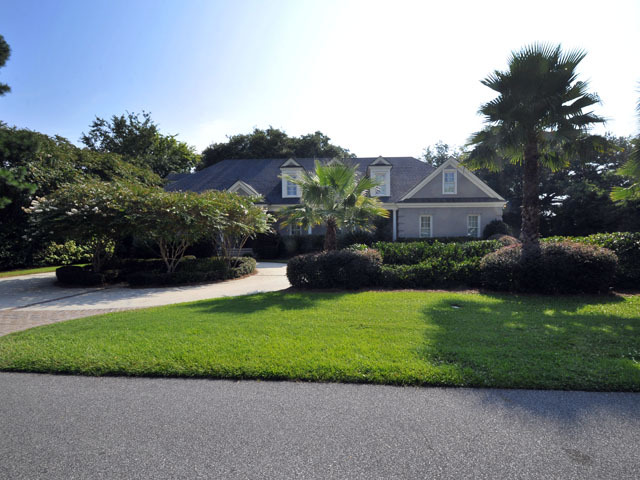 Located on the 5th fairway of the Country Club of Charleston, this high-end home at 1437 Burningtree Road offers golf course and harbor views combined with luxury, custom finishes. Four spacious bedrooms and five bathrooms make this home livable for any family. Its convenient location in James Island also places you just minutes from downtown Charleston shops, restaurants and historic sites and area beaches are just a short drive away. Designed for entertaining, the home boasts an open floor plan with ten foot ceilings, beautiful Brazilian Cherry hardwood flooring and views of the course from almost every room in the home. Upon entering, you will be greeted by the foyer which leads to the dining room alcove and formal living room. Highlights of this cohesive space include a built-in hutch, a fireplace and French doors to the back porch. The porch is also accessible from the den and has great views of the golf course providing extra open-air living and entertaining space. 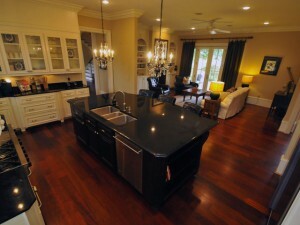 The gourmet kitchen is a true highlight and was designed with the cook in mind. Custom stainless steel appliances, granite counters, a huge prep sink and a large center island provide you with all you need to prepare meals for your family or friends. There is also a cozy den in the same area so you never miss a beat while cooking! The first floor is also home to the light-filled master suite. The bedroom is large with three sets of double French doors opening out to a private porch with views of the golf course and marsh. The elegantly-appointed master bath is a true delight, with two vanities, a huge walk-in closet with custom shelving, a large tiled shower and a separate soaking tub. The second floor has three additional bedrooms—two with en suite bathrooms. An oversized family room is a great central gathering spot on this level with vaulted ceilings, an entertainment center and a built-in bar. The second floor deck has great views of the Charleston Harbor and is ensconced by grand oaks. In addition to the two porches downstairs and the upstairs deck, there is also a large yard with mature landscaping overlooking the golf course. A large circular driveway provides ample parking and the two car garage is spacious with enough room for cars and storage. The golf course and club are located within this community, and it only takes a few minutes to get to downtown Charleston to shop or dine, or out to Folly Beach for a day in the sun!